Many of us enjoy our martial arts training. It is a great way to learn new skills, get incredibly fit and have fun, all at the same time. However, we all reach a stage where the motivation starts to lag, or we are tired from our last session or there is something else to do. One way to overcome this is to have a consistent training partner/s. Everybody from weekend warriors to Olympic level athletes need people to push them and help keep them motivated. One thing you can do is find a fellow student who is on the same level and has the same ambitions as you. They would be capable of doing the sessions with you. However, they should also be willing to push you, otherwise you will fall into the motivation trap again. They will also help you achieve more than you can on your own, which is the real value of a training partner/s. Doing your first martial arts class can be intimidating. It starts before you even attend class. With so many different styles of martial arts out there, you can never be sure which one is best for you. After you have decided which class you want to attend, you have to get past your own ego (as you will not be an expert straight away, so you need to persevere). You then need to ensure that the school’s, instructors and other students goals also align with your own. At Quantum Martial Arts, we recognise all of these problems. From the head instructors through to all of the students, we all had to start at the beginning. That is why we have aligned ourselves to the Northstar Ju Jitsu system, which teaches all of the best parts from all of the traditional martial arts styles. Personally, I believe that all martial arts styles have their place and can benefit you in self defence situation, so why not train in a system that incorporates all of the styles at the one dojo? It makes sense. When new students trial a class, they are immediately teamed up with a more senior belt. From the beginning, you are seeing the importance of a training partner who wants to help you. In subsequent classes, there will be no shortage of training partners to help you, as you cannot do the moves without help from others. When you are always training with the team, friendships emerge. These will be your training partners who will motivate and encourage you to come to class, even during those times when you do not want to. In addition, a martial arts school will always have a wide range of students with varying strengths and weaknesses. This will help you tailor your training depending on what you need to work on. There must be at least one hour per week that you can allocate for “you time”. The vehicle that allows you to keep a busy schedule…i.e. you and your body…must also be looked after as well. If you do not look after yourself, you will not be able to have much of a schedule at all. I do not need to tell you that martial arts is one of the best activities for your physical, mental and emotional self. You know that already. Therefore, if you are a morning person, do one of our morning classes. They are every Monday, Wednesday or Friday before work. If you are an evening person, do one of the evening classes. There are sometimes two classes on a weeknight, so you can do at least one of them. You can only train on weekends? That is great, as we have classes then as well. “I’m too busy” is a throwaway line that is used far too much these days, and it only hurts you. Once you decide which class you can come to, organise for your training partner to be there as well. Alternatively, the instructors will certainly be there for you. This way, you will be obliged to attend class, which will help you in the long run. Do the things that are important to you! A martial arts mentor is more than just a training partner. They are the person who will spend time with you, breakdown your technique and really guide you on your journey. They can do this because they have experienced what you have been through and can help you get to where you need to. At all levels of martial arts, most of us have turned to someone else to help guide us to the next level. My current martial arts teacher is still my mentor, even 12 years on. If you don’t have a martial arts mentor in your life, try looking to the people who are where you want to be. The larger Northstar Ju Jitsu system that Quantum Martial Arts belongs to have a huge amount of black belts who have really earned their stripes the hard way…and multiple times. They are all a huge inspiration to me. They will all do wonders for you on your martial arts journey. Try this: Mouthguard in, gloves on and let’s have some fun!!!! There are some who get into martial arts to compete in tournaments, particularly sparring. That is great. At the end of the day, martial arts is still a combat activity. It is one thing doing techniques in mid air or on the punching bag. It is a whole different ball game when that same “punching bag” is moving around and hitting back. It really puts to the test what you are learning in class. If that is the case, come along to one of the sparring classes. I used to…and still do to a degree…get really nervous before sparring. This is where the benefit of good training partners comes into play. Nobody does a sparring class to hurt others. People do sparring to improve their technique under fire. This also helps you test and improve your technique. There has never been a sparring class or a tournament where I have not come away learning something about myself and how I can do things better. Therefore, whether it is sparring class or a tournament you wish to participate in, do not let fear or worry hold you back. 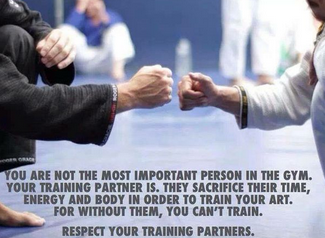 There will always be lots of training partners who will help you become better. With your training partners, it is important that you be supportive and celebrate each other’s success. The perfect training partners are those who are evenly matched yet have slightly different strengths and weaknesses, but most of all, are legitimately happy for the other one’s successes. Having others to share the work will keep things interesting and help you push yourself to the next level. I look forward to seeing you in class. I will be there with the perfect training partners.